I feel extremely fortunate. The topic I’m most interested in as a Christian also seems to be the topic that one of our leading New Testament minds has decided he wants to spend his retirement years focusing on and writing about (amongst other things, no doubt). I’ve read Richard Bauckham’s works since I was a theology undergraduate many years ago, and it has been interesting to me to watch him becoming increasingly interested in Christianity and the environment. 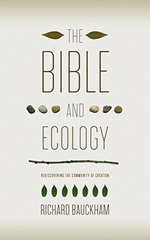 And with Bible and Ecology, he’s written what really is the best book around on what the Bible has to teach us today about our place in this world, particularly in the light of the ecological disasters that are unfolding. He writes wonderfully, insightfully and thought-provokingly, and I can’t recommend this book more highly. Find this book at Amazon.co.uk here.